A small collection of happy client correspondence. Email from an interstate client whose sails were in a bad state. Picked up sails/canvas today they are excellent. Did not think turn out so well. We just wanted to thank you for not only completely bringing our camper trailer canvas back from the brink of a mould infestation but also your excellent customer service. We were on the verge of throwing our canvas away and purchasing a new one (costing thousands of dollars) but I am so impressed with the job you have done for us and the incredibly reasonable and fair cost of your service and courier fees. I will be HIGHLY recommending you and your Business to anyone I can. Thank you again for saving us thousands! The tent canvas is way cleaner than I expected, and we are very happy with the result. It was quite damaged, and we'd had a really good go with some mould cleaners, and got nowhere. Very impressed with the quick turnaround and excellent service. It was great to meet you guys at the wooden boat festival in Hobart last week and personally thank you for a great job on our sails. 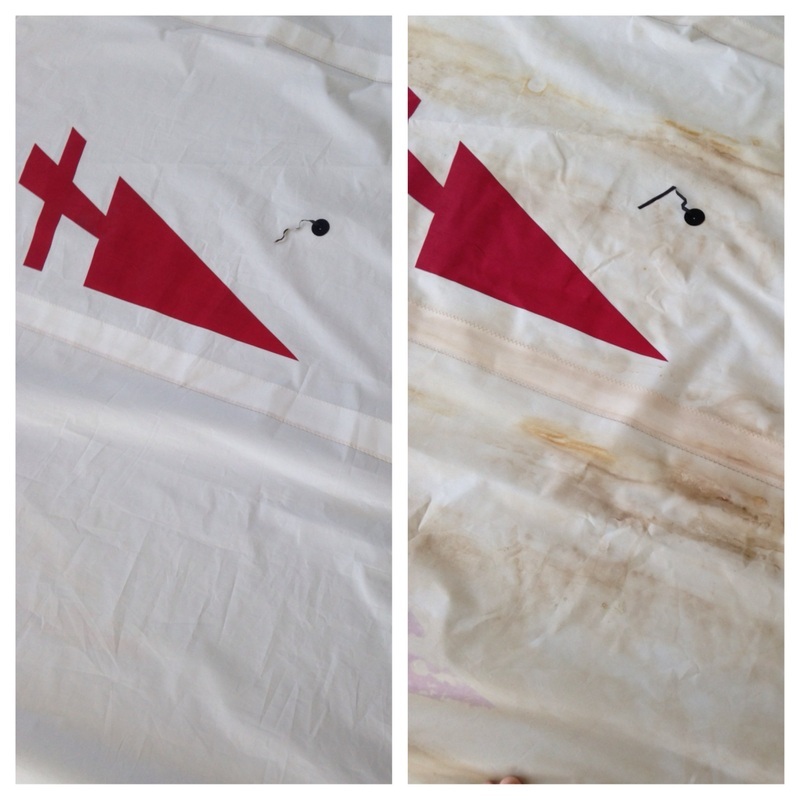 We picked the yacht up in Pittwater over Christmas and were confronted with the brown stained and mouldy sails. 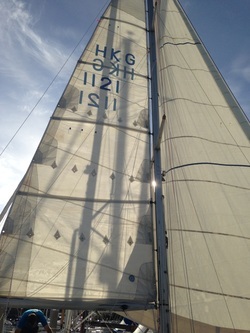 Ben at Hood sails gave you a good wrap and we crossed our fingers and toes. You guys certainly didn't disappoint, not only were the sails done in record time and delivered on a weekend ready for our trip to Hobart, they look amazing! Once again, thanks for the great service. We're happy to recommend you to anyone. Just wanted to thank you for such a great job on restoring the sails on my Moody 336. I tried everything to remove the ingrained mould that had developed while I had the boat laid up. Nothing worked. But you have managed to restore them to virtually new. ​Hi Mark, just walked over to see the covers, how good do they look! Thank you both so much, and especially for coming back and refitting the Sun beds, that was worrying me, how Id get them back on! I just want to say how very pleased I am with the outcome. The old part of the cover which is has been on the boat on a swing mooring for probably 8 years, and never washed previously came out better than new, no shrinkage, completely matched the old fixings and soft and pliable. I will pay your Invoice later today. ​A complimentary note from boat broker YOTI. 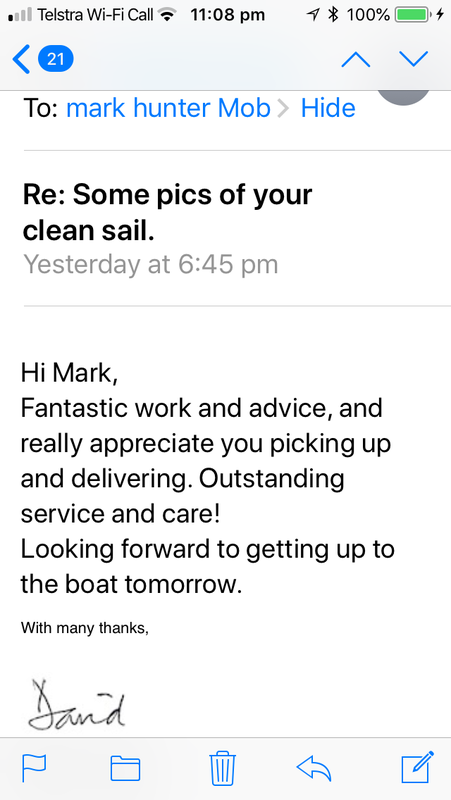 Just a brief note to pass on our thanks for another great job in looking after our recent clients and their sails. It’s very important for us that any business we deal with treats our clients as we would. Vacuwash is soon becoming a household name in the industry. Well done! Thanks for your efforts, the sails look remarkably better! We sailed on his Compass yesterday and the sail looked great. Maybe see you at the Boat Show. 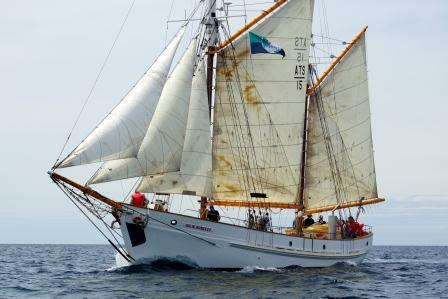 We are very pleased with the “new” sails – they look fantastic. We will certainly be telling all our cruising mates at the RPAYC. Happy Christmas to you and family as well! 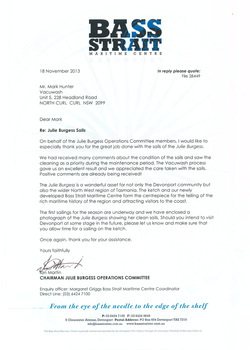 This is a letter from the Bass Straight Maritime Centre regarding the Julie Burgess sails which were Vacuwashed. "The Vacuwash process gave us an excellent result and we appreciated the care taken with the sails. Positive comments are already being received!" 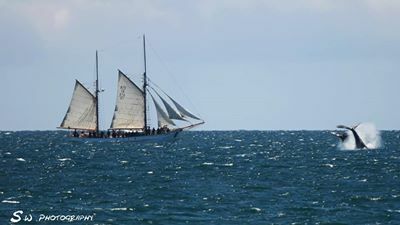 I wanted to thankyou for the gobsmacking job on my old trailer sailer sails. I still look at them to check they were the same old mildew and rat crap sodden sails that I sent down to you , they look brand new ! I cannot believe how well your process has breathed life into my old sails. I actually think they give me an extra knot on the water , and they certainly are a joy to fold away compared to sodden mould mess I used to use. I cannot recommend your cleaning process highly enough. I wish I could run my old Griffen through the cleaner as well . Subject: Re: VAcuwash Invoice ! Can unfurl headsail without frowns from fellow Northbridge sailors now. 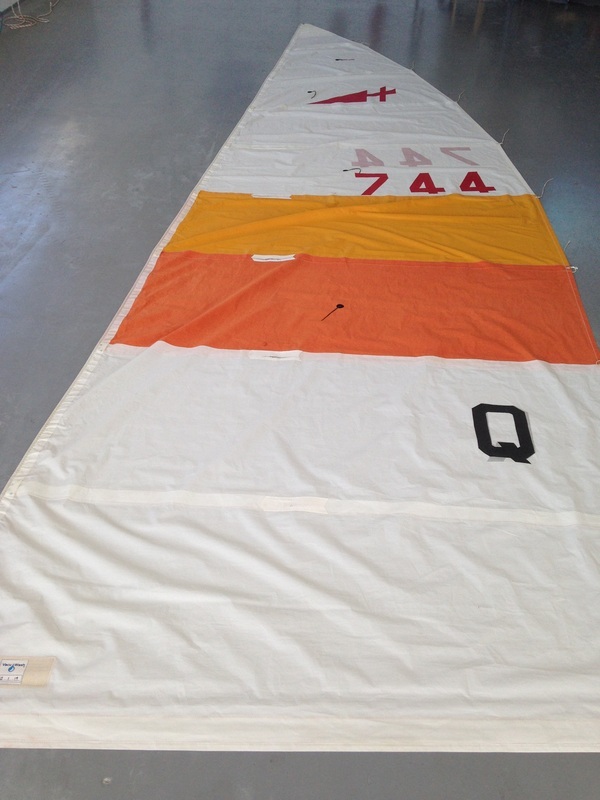 "To think I was going to bin these sails as I thought they were beyond restoring. I tried a number of things to clean the sails but to no avail. They are possibly better than when I first bought the boat as they had a couple of years use at that time. They now look new; I really can't believe it. 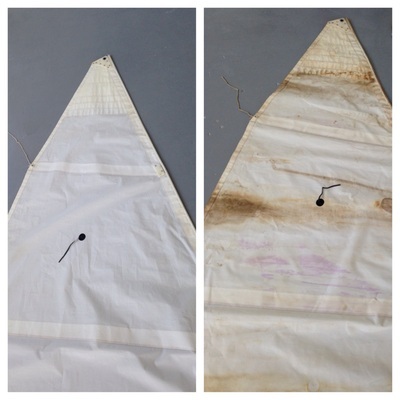 I will have no hesitation in recommending your service to anyone who wants to restore their sails.Thanks Mark!"